The link structure is one of the most important factors in SEO because it can heavily affect the Search Engine Rankings, the PageRank flow and the number of pages that get indexed. Obviously the link structure is also extremely important because it seriously affects the user experience and the conversion rates. Close monitoring of your Website’s Statistics can help you understand what your visitors look for, what are the hottest categories of your website and which pages are your “best sellers”. Continuous optimization of your link structure can help you eliminate duplicate content and promote your “best sellers” pages in order to get more pageviews and higher rankings on Search Engine results. In this article we will examine the 4 most popular Link Structure methods that are currently used, we will discuss their advantages and their disadvantages and we’ll suggest when to use each method in order to optimize both the user experience and the SEO results. As we discussed in a previous article called “Why my SEO campaign failed? Part 3: Common Link Structure mistakes”, linking all pages to all pages is a bad technique because it does not help you build a solid website hierarchy. 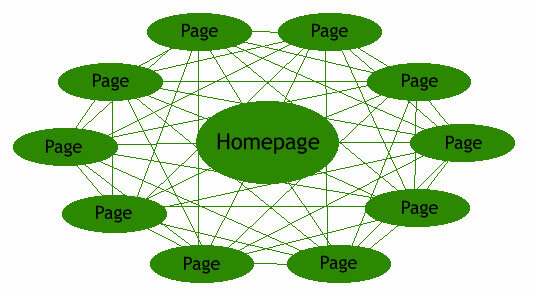 The PageRank of the homepage is divided in small pieces that flow through the links to all the pages of the website. As a result both the important and the less important pages get the same amount of link juice. Thus in large websites, the important internal pages have no chance to compete for popular and competitive search terms. The above method leads also to an increased number of outgoing links per page. This clearly violates Google Webmaster Guidelines which suggest that you should “Keep the links on a given page to a reasonable number”. This means that in large websites, the Search Engines are not going to follow and index every linked page and this will affect both the rankings and the number of indexed pages. Generally it is highly recommended to have less than 100 links per page in order to help your visitors navigate easier and to ensure that search engines will be able to understand your website’s hierarchy and distinguish the important pages. This method is suggested only for very small websites, when they have a limited number of pages that are equally important. This method uses a tree-like structure where in the zero level you have your homepage, in the first level your main categories etc. The main idea of this method is to keep the number of links per page as low as possible and create a large number of levels that are highly targeted for a specific topic. The problem of this method is that both the search engines and the users need multiple steps until they land on the pages that are located at the bottom of your hierarchy. As a result the PageRank of the top pages is very high but the link juice that flows on the bottom pages is very low. Additionally this technique causes indexing problems because search engines find it difficult to trace all the pages that are located on the low levels of the tree structure (also because of their low PageRank values). As a consequence usually the top level pages can rank high on SERPs but the bottom level pages achieve very poor results. Generally this method is avoided because of the indexing problems and due to the fact that it creates very deep menus that do not allow fast navigation. Nevertheless this architecture could be found in large websites where they intentionally want to keep the PageRank of the top level pages high and the menu very detailed. This technique uses a similar to the above tree-like structure but the main idea is to keep the number of levels as low as possible. By reducing the number of steps that are needed in order to find a bottom level page, you ensure that the user navigation is faster and that search engines will find and index the pages easier. So by using the above architecture you can have more than 1 million pages that are less than 3 clicks away from the homepage. Unfortunately this is a theoretical model that can not be implemented in real world sites. The main assumption of the model is that each page of one level links directly only to the level below and that no other links exist within that page. Nevertheless in the real world websites every page has a minimum fixed number of links that must be present at all times (main menu, supplementary menus, footer links etc). Additionally the above architecture uses a balanced tree structure which assumes that each category has exactly 100 subcategories. Of course neither this assumption can be true in real websites. Compared to deep link hierarchy, the steps needed to land on bottom level pages are fewer and the PageRank distribution is better. Nevertheless in large websites the PageRank of the low level pages remains low and the bottom pages tend to have a large number of outgoing links. The Flat Link Hierarchy is a very popular link structure technique that can be used in small, medium and large websites. Several variations of this method have been developed that reduce the aforementioned problems. For example direct links can be placed from top level pages to important subcategories or low level pages, pages of the same level can have direct links to important pages of the same level etc. This technique is a variation of the Flat Link Hierarchy that is very useful for really large websites such as Directories, E-commerce websites, Forums etc. According to this technique each page of level N does not only link to the level N+1 but also to the most important pages of the level N+2. For example if you check dmoz.org you will see that on the homepage there links for are main categories (Arts, Business, Computers etc) and also for the main subcategories of each category (Movies, Jobs, Internet etc). This technique can help you increase the PageRank of the most important subcategories and improve the indexing of the pages below. Additionally depending on the needs of the website, each category can place links to important pages of the same level. If you use the Flat or Overlapping Link Hierarchy or a similar variation you will see that the additional links that you place in each top level page can heavily affect the rankings of the below pages. Unfortunately it becomes difficult to measure manually those effects or to find which pages evaporate your PageRank and even more difficult to decide in which pages you should place links and what anchor texts to use. A great tool that can help you during this procedure is the Link Structure tool. This tool enables you to analyze & optimize the link structure of your page, eliminate all the links that evaporate your PageRank and optimize the PageRank Flow of your Website. It will give you a detailed report with the number and the list of all the URLs that are broken, it will display your link structure and it will give you a detailed view of the way that link juice flows within your webpage. By using it you can focus on your important pages, reform your link structure and improve the Rankings of your internal pages. As we discussed above the link structure is a very important SEO factor because it affects the rankings, the indexation and the PageRank distribution. 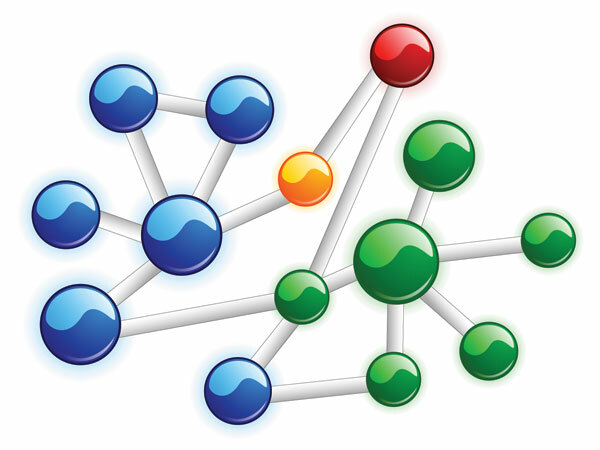 It is highly recommended to select the most appropriate Link Structure technique before starting the development of the website and use the appropriate tools to evaluate your link architecture. This can help you reduce costs and improve the SEO campaign. Additionally it is strongly recommend to analyze regularly your link structure and to make corrections based on the statistics and web metrics. In the next article we’ll discuss the most important tips that can help you design and implement your Link Structure. Additionally we will focus on the traps that you should avoid in order ensure that your Link Juice flows to the most important pages and that the search engines will find and index your website’s pages.